In 1942, the Army Air Corps opened Laughlin Field as a training base for the Martin B-26, but it was deactivated in 1945. As the Cold War pressures built, Laughlin Field was rebuilt and renamed Laughlin Air Force Base. It was again used as a home for flying training. In the mid-1950s, the Strategic Air Command noted Laughlin's remoteness that allowed for secret operations, and opened its strategic reconnaissance program there. The RB-57 (a long-winged version of the new jet bomber, the B-57) was initially stationed there April 1st, 1957, and shortly thereafter, SAC introduced the highly classified U-2 to Laughlin. These planes flew high altitude reconnaissance missions over countries behind the Iron Curtain. The 4080th Strategic Reconnaissance Wing, which operated the U-2, was credited with obtaining the first pictures of the Soviet missile build-up in Cuba during October of 1962, beginning the "Cuban Missile Crisis". The only casualty of the crisis was Laughlin's Major Rudolph Anderson whose U-2 was shot down over Cuba. 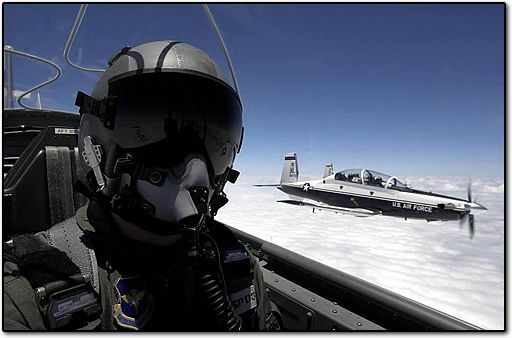 In 1962, SAC transferred control of the base back to the Air Training Command and the following year, the 4080th moved its strategic reconnaissance program to Davis-Monthan Air Force base near Tucson, Arizona. Since then, Laughlin has housed the Air Education and Training Command Undergraduate Pilot Training program. 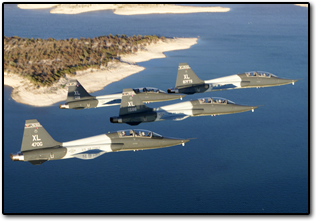 Now one of five USAF pilot training facilities, Laughlin has trained about 14,500 U.S. Air Force pilots to date.